Morro Bay, CA – Yes. Unbelievable! I had been waiting for the statement from French Hospital for some time. I had been a patient a few weeks earlier. Finally I got the statement. Looked right away at the bottom line. More than $8,000! Wow! And I hadn’t even been an inpatient. Just an outpatient. A whopping mistake for sure! Must be somebody else’s statement. Here’s the whole story. First, there’s nothing French about the hospital. It’s named for a person by that name. A lot of people get confused. Right away I called my daughter Monique to tell her and her husband how much. David answered. She also picked up. They were the ones who rushed me to French. Had been there every minute of that. “Yes, it is,” David said. Monique agreed. Who wouldn’t? Well, let me tell you exactly what happened to me that night. Then put yourself in my shoes..
First, things you should know about me. I live alone. I am in my 90th year. Some of you know that but maybe you don’t. I believe I’m considered a fair and reasonable person, not given to snap judgements or blowing my top. Now specifics about what I went through that day. It was July 17, about 4 p.m. and I was in bed. Highly unusual. I was feeling awful. My dentist had yanked a tooth two days before. Maybe that was part of it. Anyway I was miserable. Dizzy, nauseous, exhausted. So lousy that I called Monique. David picked up. He said she was at work. I told him my bad news. He got the picture right away. They live less than 10 minutes away. He rushed over. Came right to my bedroom. Saw I was darn miserable. 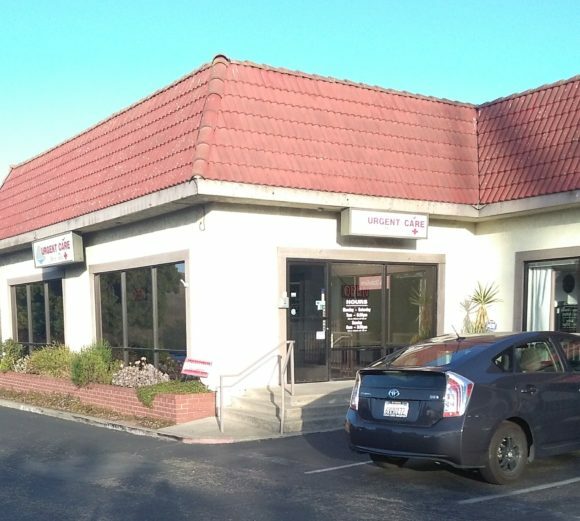 The Morro Bay Urgent Care Center is three minutes away. It’s an independent, stand-alone operation. No hospital here. The hospital is in San Luis Obispo, the big city a few miles south. David helped me dress. First, I made sure to put my hearing aid in my left ear. My right ear is dead. Zero. He eased me into their car. Helped me up the steps into the office. It was about 4:30. The receptionist welcomed me. Gave me a form. A very long form. Which I filled out. Monique came rushing in. “What’s wrong, Dad?” I filled her in. “Probably a minor thing,” I told her. An R.N. appeared. “What’s the problem, sir?” I explained. David added info of his own. Monique gave other details about me. The R.N. walked me into an exam cubicle. Looked me over. Took my temp, my blood pressure. Asked me for a pee sample, did other things. “The P.A. will be right in,” she said. P.A. meaning Physician’s Assistant. No M.D. here. “An MI? That’s a heart problem, isn’t it? Now I was getting even more antsy. Was I that sick?! Monique and David weren’t smiling, I noticed. The P.A. didn’t wait for me. He went ahead and called 911. Connected with the Fire Department. It’s only a few minutes away. The firefighters arrived fast. They’re all trained as paramedics, it seems. These days I’ve heard firefighters respond to more medical emergencies than fires. One, the leader, it was obvious , checked me. A bit like the P.A. Was quite thorough. Even did an EKG. My second. Told me they’d take me to the hospital ER. Their ambulance was at the door. The crew had brought in a stretcher for me. “Let’s go,” hc said. He stared at me. “Okay, if that’s what you want.” I could see they don’t get turned down often. They began packing up. “Good luck, sir,” he said. Monique and David gave me a hand. Got me into their car. And off we went. I thanked the Urgent Care staff. They had done an excellent job. Glad we have it in Morro Bay. I’d spread the word about that. We got right to the door of the E.R. in just 25 minutes. Even with two red lights. Monique rushed in to explain. Came back with an attendant. He was pushing a wheelchair. Helped me get seated. It was about 6 p.m.
At my age I’m familiar with hospitals and emergency rooms, believe me. As expected, lengthy preliminaries. A long form to fill out. Name and all that. My health insurance–Medicare and Blue Shield. Next of kin. My primary care physician. On and on. Documents to sign. For sure they certainly didn’t think I was in dire straits. Finally I got wheeled down the hall and into an examination room. Monique and David had to stay behind. An R.N. introduced herself. More questions. Then the process got serious. Scans. Blood draws. Hooked me up to an IV. Did this and that. A doctor came in and introduced himself. “I’m Doctor Malcolm,” he told me pleasantly. I’ve changed his name. He was relaxed. I relaxed a bit. In fact I was feeling better. I asked if Monique and David could join us and he said sure. Greeted them nicely. I answered his questions and Monique added a lot of info. She asked questions of her own and he answered. He didn’t act rushed and I liked that. “Well, we’ll get right to work,” he said. Added he’d be back later, after he got all the test results and evaluated them. As we know, everything in medicine is a specialty today. Everything. He wasn’t just an M.D. He was a board-certified emergency room physician. He was in his 50’s, I’d say. The perfect age, in my opinion. Old enough to be thoroughly experienced. Young enough to still be keeping up with medical developments. I felt good about him. Some of the tests involved big machines. I was alone in the beginning. Then Monique and David came and sat with me. I rested and relaxed a bit and dosed and they stayed with me through all that. Dr. Malcolm came back very late, close to midnight. In fact, midnight came. Monique and David were still with me. I asked if they could listen in. “Sure. Absolutely.” And gave them a smile. A friendly fellow Dr. Malcolm. He looked at me. “You’re going to be all right, sir. But you have two problems.” I held my breath. The first was dehydration. That was certain. The second was tentative. Possible angina. Dr. Schingler (true name) is my primary care physician. Knows me well. I like him. We have a nice relationship. But the cardiologist? He gave me her contact info. Yes, a lady. No problem with that though I doubted strongly I had a need. But I said yes, I’d go see her. I wanted to be cooperative. Monique and David had been listening to all this. Monique had asked questions of her own. David added input. Dr. Malcolm was patient and pleasant. I liked him. And I had been greatly impressed by all the technology I’d just been through. I saw them doing routine things but with ways and equipment all new to me. Ultra-technology, that’s what I thought it was. Fantastic technology. And I told him so. He nodded and smiled. There was one other thing. Very interesting. Dr. Malcolm had trained back in Massachusetts, in fact, in Worcester. The second largest city in New England. And talk about an interesting coincidence. Just at that time when he was training, I was an editor at the Worcester Telegram-Gazette. The T&G was the big morning and afternoon and Sunday newspaper that served that whole area. We got chatting about all that. And there was a wonderful store back then, sold all kinds of stuff, unique, enormously popular, people shopped there from all around. It was called Spag’s. Spag was the owner. He loved spaghetti! People loved Spag and his store. I was a regular there. “It’s this,” I said, and pointed to the johnny I was wearing. The johnny that I had been told to change into when things got serious. “Doctor,” I said, “this johnny hasn’t changed one bit. One bit in more than 50 years! Oh, maybe the cloth is better. But it’s really the same, same old johnny. It really is.? If, dear reader, that word is not familiar to you, “johnny” is what it’s called back where I come from. I’ve found in other parts of the country they just call it a hospital gown. Well, way back when I went to a hospital when I was just 20 or 21, I was given a johnny to put on. I’ve had to go to hospitals many times over the years. Same old johnny every time. Unchanged. Dr. Malcolm was all ears. And I told him when I was in a hospital back in Connecticut, about four years ago, I had had to put on a johnny again. Looked at it and thought, I can do better than this! Did some serious thinking. Designed a new johnny. Had a seamstress make one, then another, then a third, each better. And finally came up with my current johnny, which I must tell you still closes at the back. That’s the essential feature that has made the johnny so popular these many years. But mine is improved also in several important ways. For one thing, you no longer have to walk around with one hand in back to keep your fanny covered! In actual fact, my design’s important innovations became such a dramatic breakthrough that I applied to the U.S. Department of Patents and Trademarks to protect the name I had given it. Which is MedGown. Spelled just like that. And told Dr. Malcolm I’ve been working to promote the MedGown. Far better for patients. Far better for doctors and nurses also. He had been listening intently. Maybe he thought the old design was just fine. Maybe because he never had to wear one. Truth is, health professionals who have seen it have complimented me. Overdue! But no time to tell you about all that here. If you’re interested, let me know and I’ll tell you the whole story. Anyway, all this chatting had taken a lot of minutes. It was close to 1 a.m. when we left. In parting, Dr. Malcolm wished me good luck. A nice fellow. I was pleased to thank him for his concern and expertise, which were very real. Monique and David took me home. This ride back was a lot more relaxed though David is never a slowpoke. They helped to get me ready for bed, then said goodnight. I was feeling a lot better. They had come through marvelously for me again. Lucky me. “I will!” And I meant it. I did see her. I’ll call her Dr. Robbins. I did go see her for a treadmill stress assessment. I had gone through one some years ago. Knew what if was all about. When she saw me for the first time, which was on the morning for the test, she paused. Said they could get the same results in a different way, without putting me on the treadmill. I could see she thought I wasn’t up to the treadmill. But I said, “I’d really prefer to do the treadmill, Doctor.” She said okay. She wasn’t enthusiastic. Well, I did remarkably well on the treadmill. I could see she was impressed. My daily workout on my trike has been fun and good in several ways. That was the main reason I impressed her. When I got the results, it confirmed what I thought. No heart problems. Well, as I said, it took days, but finally my statement from French Hospital arrived. And you know I was stunned by the huge $$$ bottom line. I called French immediately. Asked for “Billing.” Finally reached the right person. She listened. I mentioned I had been in Emergency about six hours. And much of that had been waiting for this and waiting for that. “Well, okay, I guess. Thank you.” That ended the conversation. – Laboratory. Four tests. $162. – Lab / Chemistry. Six tests. $3,357. – Lab / Hematology. $581. Now, dear reader, please tell me. What ordinary Joe or Jane can make any sense of all that?! I’m especially curious about that charge of $3,021 for the Emergency Room. That’s a biggie! I wonder what exactly, precisely. was that for, in detail?! Hard for me to imagine. Your guess is as good as mine. Anyway, the statement clearly says that I was there two days, July 17 and 18. In actual fact, I was there just that one hour on the 18th when Dr. Malcolm signed his report and we chatted about Worcester and all the technology and my MedGown. The statement acknowledges all the services did take place on the 17th. So as I understand it, I wasn’t charged for the second day that I thought I was being charged for. Thank God. Thank God also that I skipped the Fire Department’s ambulance ride. You heard the more than $2,000 estimate I was given for that. Also thank God I declined Dr. Malcolm’s suggestion that I remain in the hospital for monitoring and further treatment. Imagine how the final dollar total would have ballooned! I haven’t mentioned the Urgent Care’s bill. The fact is I did not remember paying a bill from it. I stopped by a couple of days ago. Was told Medicare had paid for it. And how much was that, I asked. Had I heard right? “Yes, just $56.” In its tiny way that was as incredible as the hospital’s huge total. Medicare paid the big part. The exact sum is not mentioned. Blue Shield, my secondary insurance, paid the lesser part. That isn’t mentioned either. So what did I wind up having to pay? Just $50! So, you may be wondering, gosh, why have I gone through this awful process of investigating and complaining? With such a small copay, hardly worth the effort. You’ll probably think I should have dismissed the whole horrible thing and have thanked my lucky stars for my fine coverage. Right? Why bother? Well, I feel Medicare is being shafted. And so is my secondary provider, Blue Shield. And so are we taxpayers and insurance buyers. Well, I’m not a solitary example. There are many other folks. Thousands. With far more expensive and disturbing hospital experiences than mine. I firmly believe there’s a lot of tightening up that’s needed through the whole system, and at every step. I just did a bit of math. Six hours is 360 minutes, right? And $8,097 divided by 360 minutes is $22.49 per minute. Okay, maybe that bit of arithmetic was kind of a crazy thing to do. But I just had to satisfy my curiosity. I feel like sending a report about all this to both the president and CEO of the hospital. And to my U.S. senators and congressman. And the director of Medicare and the director of Blue Cross. And even Dr. Malcolm. And a couple of big newspapers. That would give all of them something to think about. Truth is, one more concern is running through my mind. Were all those tests really necessary? For instance, the EKGs duplicating those by Urgent Care and the paramedics. And other expensive tests by the hospital. Really necessary? Maybe yes. Maybe not. Oh, perhaps necessary in the opinion of the doctors and others who bill for them. Why so? For some of them — I certainly will not say all — the juicy profit incentive may be hard to resist. My opinion. I’ll bet every day countless Americans are stunned to receive whopping medical / hospital statements like mine. And even worse. Bitterness and cynicism and resentment are the result. Very sad. Especially when we find out a number of other countries provide better medical care for far less money. That’s an established fact, folks.